April is Parkinson’s Awareness Month, and FirstLight® Home Care is honored to support the needs of those affected by Parkinson’s disease. 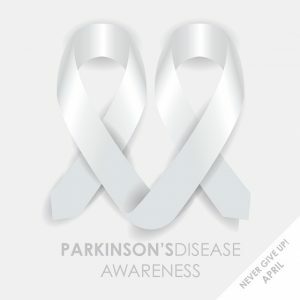 Parkinson’s disease is a progressive disorder of the nervous system that impacts more than 10 million people worldwide. The neurological disorder affects movement, and it typically develops gradually. For example, it may start with a barely noticeable tremor in just one hand. In early stages of the disease, your face may show little or no expression, or your arms may not swing when you walk. Your speech may become soft or slurred. And, unfortunately, Parkinson’s disease symptoms worsen as your condition progresses over time. Tremors. Tremors are the most recognizable sign of Parkinson’s disease. A tremor, or shaking, usually begins in a limb, often your hand or fingers when relaxed or at rest. Some people also may experience a back-and-forth rubbing of the thumb and forefinger, known as a pill-rolling tremor. Stiffness and slowed movement. Over time, Parkinson’s disease may reduce your ability to move. Slowness in your movement will make simple tasks, like getting out of a chair, difficult and time-consuming. Loss of smell. Trouble smelling foods like bananas, dill pickles or licorice can be an early sign of the disease. Trouble moving or walking. Stiffness or pain in your body, arms, and legs that do not go away as you move can be an early sign. Voice changes. The disease affects movement in different ways, including how you speak. Slurred speech is common in advanced stages of Parkinson’s. Less dramatic voice changes can occur in early stages of the disease. Enunciation may remain crystal clear, but what you might experience is unintentionally speaking more quietly. People in early stages of Parkinson’s often speak in low tones, a hoarse voice, or with little inflection. Impaired posture and balance. Your posture may become stooped, or you may have balance problems. Contact us today to learn more about our personal care and companion care services in your area, and to see how we can help.